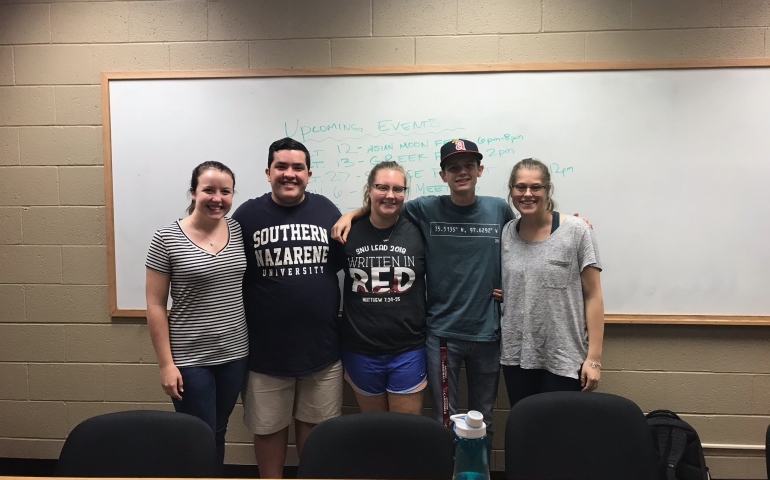 Southern Nazarene University’s (SNU) ProDeo club hosted a panel last Tuesday during which students who have gone on SNU in Missions (SIMs) trips had the opportunity to speak their words of advice to students who are considering applying. Among those on the panel were Sarah Gunter, junior Biology major and Ben Sikes, junior multidisciplinary Psychology and Theology major. Gunter, who went on a SIMs trip to New Zealand and Mongolia, pointed out the cultural differences that she experienced on her trip and how they shaped her view of the church in America. “They are working very hard to grow the church and you can tell that they are very passionate about the church, which you don’t find a lot in America,” Gunter said about the church in New Zealand. People do not rush out of church like Americans; they stay and have fellowship with one another. Sikes and Gunter both emphasized on the growth that students will experience if they go on a SIMs trip. Students will serve in different ways at each site, but they are confident that if people are present and willing to receive, they will grow tremendously while serving others. Daniel Buckwalter, junior Pastoral Ministries major who also went to New Zealand, said, “We may not have some grand, amazing impact on their lives, but it’s an opportunity to show them what the love of Christ looks like…and as their life goes on, it’s an opportunity for them to feel loved.” He urges students to go on a SIMs trip to experience life through the eyes of people who are different. While SIMs does require a cost commitment for students, Gunter, Sikes, and Buckwalter all said that their mission trips were well worth it. SNU provides various ways for students to fundraise as both individuals and as a team. Cost should be of some consideration for students thinking about applying for a SIMs trip, but if God is calling someone to go, then He will provide a way. This year’s SIMs sites were announced during chapel on Sept. 18. Students will be selected to engage with people in Brazil, Cambodia, Costa Rica, Ecuador, eSwatini, Germany, Kenya, Luke Commission, New Zealand, North Carolina, Nazarene Youth Conference in Phoenix, South Africa, and Ukraine. Students who feel called to go on a SIMs trip can fill out an application at tinyurl.com/SIMs2019apply after which they will have an interview with Deanna Thomason to be placed on a team.